Home / Friday The 13th: The Game / Video Game News / Shelly Finklestein Returns In Friday The 13th: The Game! Shelly Finklestein Returns In Friday The 13th: The Game! We love Shelly, the lovable, yet insecure prankster that visited Higgins Haven in Friday The 13th Part 3. Over the proceeding years, the character that Larry Zerner brought to life has continued to gain a cult following. Franchise fans have been asking for an official Shelly figure the past couple of years and when Friday The 13th: The Game was announced, many of our readers immediately hoped Shelly would return in a digital Friday world. When characters like Tommy Jarvis and Fox were introduced into the game, it seemed like it was only a matter of time before Shelly would be pranking his way back into all of our hearts. Thanks to the announcement by Gun Media tonight. 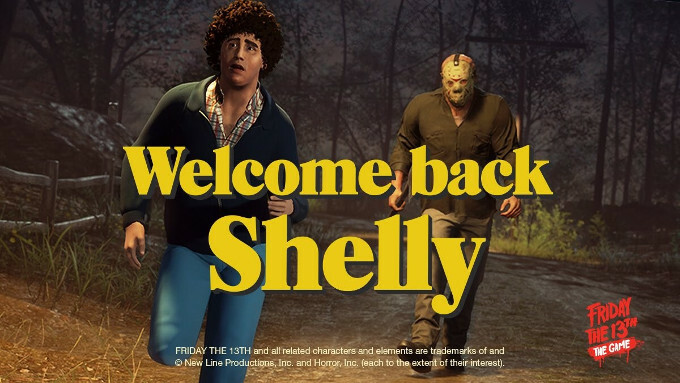 Shelly is indeed back in Friday The 13th! Shelly Finkelstein will be coming back to Camp Crystal Lake to troll his fellow counselors…that is until Jason shows up! Get Shelly for free with the latest patch! The latest update will be coming for PS4 and Steam on Monday, Dec. 18th with the Xbox One patch to follow shortly. Watch the announcement video below and remember, Shelly just wants you to like him!